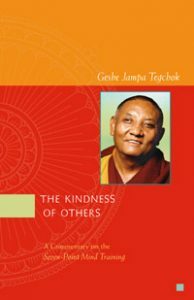 You can read this book here or order a print copy or ebook version of the book from the Lama Yeshe Wisdom Archive. Nagarjuna. Nagarjuna’s “Precious Garland": Buddhist Advice for Living and Liberation. Analyzed, translated and edited by Jeffrey Hopkins. Ithaca: Snow Lion Publications, 1998. Pabongka Rinpoche. Liberation in the Palm of Your Hand. Translated by Michael Richards. Boston: Wisdom Publications, 1991. Shantideva. A Guide to the Bodhisattva Way of Life. Translated by Vesna A. Wallace and B. Alan Wallace. Ithaca: Snow Lion Publications, 1997. Sopa, Geshe Lhundub. Peacock in the Poison Grove. Edited and co-translated by Michael Sweet and Leonard Zwilling. Boston: Wisdom Publications, 2001. Tegchok, Geshe Jampa. Transforming Adversity Into Joy And Courage: An Explanation Of The Thirty-Seven Practices Of Bodhisattvas. Edited by Thubten Chodron. Ithaca: Snow Lion Publications, 1999. Tsong Khapa, Lama Je. The Great Treatise on the Stages of the Path to Enlightenment. Three volumes translated by the Lamrim Chenmo Translation Committee. Ithaca: Snow Lion Publications, 2000, 2002, 2004. Chödrön, Pema. Start Where You Are: A Guide to Compassionate Living. Boston: Shambhala Publications, 1994. Druppa, Gyalwa Gendun, the First Dalai Lama. Training the Mind in the Great Way. Translated by Glenn H. Mullin. Ithaca: Snow Lion Publications, 1993. Gehlek Rimpoche. Lojong: Training of the Mind in Seven Points (edited transcript). Ann Arbor: Jewel Heart Publications. See www.jewelheart.org. Gomo Tulku. Becoming a Child of the Buddhas: A Simple Clarification of the Root Verses of Seven Point Mind Training. Translated and edited by Joan Nicell. Boston: Wisdom Publications, 1998. Gyatso, Tenzin, HH the Dalai Lama. Awakening the Mind, Lightening the Heart. San Francisco: HarperSanFrancisco, 1995. Khyentse Rinpoche, Dilgo. Enlightened Courage: A Commentary on the Seven Point Mind Training. Translated by the Padmakara Translation Group. Ithaca: Snow Lion Publications, 1993. Konchog, Geshe Lama. A Commentary on the Seven Point Mind Training. Kongtrul, Jamgon. The Great Path of Awakening. Translated by Ken McLeod. Boston: Shambhala Publications, 1987. Nam-kha Pel. Mind Training Like the Rays of the Sun. Translated by Brian Beresford, edited by Jeremy Russell. Dharamsala: Library of Tibetan Works and Archives, 1992. Pabongka Rinpoche. Op cit. Contains a translation of and a commentary on the Seven-Point Mind Training, pp. 589–625. Rabten, Geshe, and Geshe Dhargyey. Advice from a Spiritual Friend. Translated and edited by Brian Beresford, with Gonsar Tulku and Sharpa Tulku. Boston: Wisdom Publications, 1977, 1996. Tharchin, Sermey Khensur Lobsang. Achieving Bodhicitta. Howell: Mahayana Sutra and Tantra Press, 1999. Trungpa, Chogyam. Training the Mind and Cultivating Loving Kindness. Boston: Shambhala Publications, 1993. Wallace, B. Alan. Buddhism With an Attitude: The Tibetan Seven-Point Mind-Training. Ithaca: Snow Lion Publications, 2001. The commentary I have been following talks about the old and new translation schools. The former means the Nyingma School. Of the four main traditions of Tibetan Buddhism, the Nyingma is the old Kadam and the Sakya, Kagyu and Gelug are the new Kadam. Within these traditions we find slight differences in the wording of the different versions of the root text of the Seven-Point Mind Training. This is not a case of correct or incorrect but simply that over the years certain differences have arisen. The root text I have been following was compiled by the twentieth century Gelug lama, Pabongka Rinpoche,29 and the commentary I have used was composed by Chigja Rinpoche at the request of Kungo Palden, his manager, who explained that he found the root text and extant commentaries hard to understand and asked Chigja Rinpoche to compose one he could comprehend. This now finishes the explanation of the Seven-Point Mind Training based on that root text and commentary. There are two activities—at beginning and end. As I mentioned in the teaching, the important activity at the beginning is motivation, so please try to be careful with that. Cultivate the habit of thinking about your motivation first thing in the morning, the way a smoker lights up as soon as he gets out of bed. Once we become familiar with setting our motivation first thing, it goes quite smoothly. However, we have to continue working on our motivation lest faults creep in. It’s not enough to assume that since what we’re doing is beneficial for others we can just leave it at that and not think about our motivation any more. On the other hand, if we continue to think about our motivation all the time, our practice won’t be quite right either. What we should do is reflect on our motivation at the beginning, do the practice properly and then conclude it in the right way. If we do all this correctly our practice will be complete. We should also make a habit of reviewing our day before we go to bed each night, asking ourselves how well we did in actually working for the benefit of others, as we set out to do at the beginning of the day. If we find that we did quite well in working for the benefit of others, we should feel very appreciative of ourselves, rejoice, and make prayers and dedications. If we find that we did not do so well, we should try to feel remorse, regret whatever went wrong and purify it. This is the way to shape our mind. Thus, in the context of the two important activities, one at the beginning and one at the end, the latter is dedication. Dedication is a specific type of prayer we make when we have something to dedicate. If we do something virtuous we can dedicate it with a special prayer; merely saying the prayer itself does not create any merit to dedicate towards the intended result. However, if we have been careful to start our day with bodhicitta motivation, as above, our actions that day should have produced some merit, so that night we should dedicate it to attaining enlightenment for the sake of all sentient beings. Even though we talk about these important activities at beginning and end, the teachings actually say that we don’t need to set aside a special time for practice. Rather, we should transform all our daily activities—walking, coming, going, sitting, sleeping, eating, working and everything else we do—into practice. We might find it difficult to do this at first because it’s hard to remember to do it all the time but if we make the effort it will get progressively easier. Take the simple activity of eating, for example. There are many ways to eat in a Dharma way, depending upon the level of our practice. Those who have taken bodhisattva vows can transform eating according to Paramitayana or Vajrayana, but at the basic, less esoteric, level we can think simply that we’re offering what we’re eating to all the sentient beings that inhabit our body, aspiring in future to satisfy them with the Dharma just as we’re presently satisfying them with food. In this way we can transform our action of eating into Dharma. When we go to bed we can recollect the qualities of the Buddha and our various Dharma practices and in that way go to sleep in a positive frame of mind, thus making the whole time we’re asleep virtuous. Therefore, even though it is good to set time aside to do retreat when the opportunity arises, it is probably more important to try to transform all our activities into Dharma. The methods for doing so exist. I know they’re difficult and I don’t claim to practice them all myself; if someone were to ask me if I can do all these practices I would reply that I cannot do them all. However, it is excellent to try, and the more effort we put in the easier it becomes. Another thing I’d like to stress is the importance of keeping our mind steady in the sense of not getting too puffed up because of our accomplishments and knowledge, worldly or spiritual. Either way, it’s dangerous and harmful. If we find ourselves becoming arrogant we should look around and recognize there are definitely other people who know more and can explain things better. Whatever we feel proud of knowing, we should remember that others know more and looking up to them can help bring our mind back down. Alternatively, sometimes we might feel a bit depressed, thinking, “No matter what I try, I’m just no good at anything. I’m no good at worldly things; I’m no good at Dharma practice.” But if we look around we’ll see that there are others who are worse. Comparing ourselves to them can help bring our mind back up. We need to apply the mental factor of vigilance to check ourselves all the time to see whether or not what we’re doing is worthwhile, whether or not we’re really practicing. We don’t have to be doing anything visible, reciting mantras or sitting in the meditation posture to be genuinely practicing Dharma. As long as what we’re doing is truly beneficial for others there’s no reason it’s not Dharma. Therefore we must be constantly mindful and aware of what we’re doing to make sure that we’re always on the right track. There’s a story from Atisha’s time in Tibet, where he had many disciples. Once he checked to see who had the higher realizations—Dromtönpa, the disciple who spent all his time serving Atisha, or Neljorpa, who spent all his time meditating in retreat. What he found was that Dromtönpa, who continually waited on him hand and foot, helping and serving him, had more realizations than Neljorpa. That was because Dromtönpa was constantly vigilant to ensure that everything he did was of service to his guru. Since he was able to transform all his activities of body, speech and mind into Dharma, he became the more highly realized. Also, when Tibet’s great yogi Milarepa was living up in the mountains, people would come up and make offerings of food and help to the meditators. He observed that the meditators and those offering food and help became enlightened simultaneously. Actually, the fact that they reached enlightenment at the same time is a dependent arising. Like the story of Dromtönpa and the meditator, this story shows that those who helped the meditators up in the mountains with a good motivation purified much negativity and accumulated extensive merit. It is said that the root of all Dharma practice is the mind—our attitude and way of thinking—and that if our motivation is pure, whatever we do becomes Dharma, whether it benefits others directly or not. There’s a saying that a person with a good mind lying down sleeping is much better than a person with a bad mind sitting in meditation. This is very true. So what if a person full of malicious thoughts, who always harms and speaks very spitefully to others, sits up straight, eyes half-closed in the correct meditation posture? That’s not particularly amazing. What’s more remarkable is an ordinary person full of friendly and caring thoughts, who always avoids harming others and is very humble and considerate, lying down to sleep—that person’s mind doesn’t become negative but continues to grow more positive, even when asleep. As I mentioned before, when we see that death is imminent we should be able to think, “Well, it’s OK to die. I’ve led my life as best I could, I’ve not done anything really bad, so there’s no reason to regret dying.” However, when we see that our death is not imminent we should feel happy that we’re not about to die and that there are many good things we can do with the rest of our life. Because it is a Mahayana practice, we should never engage in mind training for ourselves alone but always for the sake of all the countless other sentient beings. When our motivation is to attain personal liberation for ourselves alone, although in general this is neither bad nor non-virtuous because it leads to the state of a Hinayana arhat, it’s not appropriate for Mahayana practitioners. Similarly, if our motivation is to be reborn as a human or a god because we’re desperate to avoid the unbearable sufferings of the lower realms, this isn’t bad or non-virtuous either—it’s still Dharma—but it’s a small scope practice and again not worthy of a great scope practitioner. However, if we practice simply to receive praise, veneration or offerings, gain followers or become rich and famous, then even if we meditate all night and day, it can never become Dharma. No matter how hard we practice, if we’re doing it for just this life, it’s not Dharma. For our actions to become Dharma they must be completely unmixed with any thoughts of gain for just this life. If our motivation is mixed with the purpose of this one life, it is deeply polluted and nothing we do will turn out well. It’s like pouring nectar into a jar of poison. The very best thing we can do is to work constantly for the benefit of all sentient beings, who are as infinite as space. If we can’t manage that, we should try to gain personal liberation, and if that too is beyond us, then we should at least try to avoid the suffering of the three lower realms. That’s still Dharma practice; it’s not non-virtue. It’s neither wrong nor evil; it’s just not the highest practice we can do. Integrate all the teachings into one thought. We should understand that the one underlying purpose behind all the teachings of the buddhas and bodhisattvas is the elimination of the self-cherishing and self-grasping minds. Primary importance should be given to the two witnesses. This means that if, for example, we’re falsely accused of stealing, even though we might be able to call up a witness to testify to our innocence, we ourselves are the main witness because we know that we are, in fact, innocent and will not have to experience the karmic results of this action that we have not actually created. We must sustain our practice whether things are going badly or well. When they go badly we sustain ourselves by using the techniques of transforming difficulties into the path, and, in this way, whatever happens, always maintain our practice and remain on the spiritual path. Some people tend to get angry at the slightest provocation and say or do all kinds of destructive things. We should not be like that but try to remain steady in our practice. Instead of being touchy and easily upset, when things go badly we should think that it’s OK; we should be easygoing. Equally, when things go well, we should think that that’s OK too and be easygoing at such times as well. Everybody appreciates easygoing people and their consistency throughout the day. This is how we should be in our practice. The measure of a trained mind is that it has turned away. At this point the commentary mentions certain signs indicating some success in our mind training. For example, when we’ve been practicing for a while, even though we might not have fully abandoned every last sign of selfishness, having been able to weaken it a little is a sign of success. In other words, we know that we’re doing well if our selfishness has at least diminished. (a) The great ascetic—when we’re well trained we can accept all kinds of suffering if doing so enables us to benefit others and sustain our practice and can tolerate difficulties for the benefit of all beings or even just the community in which we live. It has various levels. (b) The great being—we care more for others than ourselves. (c) The great practitioner—our mental, verbal and physical activities mostly, though not completely, accord with mind training. (d) The great disciplined one—we refrain from activities that harm others. (e) The great yogi [or yogini]—we can combine the understanding of emptiness with our activities on various levels for the benefit of others. By persevering in our practice of mind training we’ll find that these five signs gradually manifest and then become stronger and stronger. The commentary says that when we have trained our mind we can maintain control and continue practicing even when we’re distracted, just like an experienced horse rider doesn’t fall off, even when distracted. In this book, Khensur Rinpoche Geshe Jampa Tegchok explains how we can train our mind away from self-cherishing, the cause of all suffering, and develop compassion, the cause of everything that is good. He bases his explanation on Kadampa Geshe Chekawa’s classic text, The Seven Point Mind Training, which, amongst other things, teaches us how to transform problems into happiness.You can read this book here or order a print copy or ebook version of the book from the Lama Yeshe Wisdom Archive. 1. The Dhammapada, Chapter 14. 2. See Chapter 10: Conclusion. Khensur Rinpoche Geshe Jampa Tegchok gives a commentary on the Seven-Point Mind Training. He bases his explanation on Kadampa Geshe Chekawa’s classic text, The Seven Point Mind Training.